Springs are arguably the most important parts of your garage door system, as they support the door's weight during operation and act as the system's muscles. There are two main types, extension and torsion, and each of them operates very differently. These are the older variety; they usually come in pairs, and are installed on each side of your door, drawing inwards into your garage parallel to the horizontal tracks. They work by stretching when the door is closed, and contracting when it is opened. They usually require additional safety cables to be installed, as the nature of their action makes them more liable to snap, and therefore extra safety measures are a must. Springs of this type are different in many ways. For once, they are far stronger, and therefore oftentimes only one of them will be required to operate your garage door, depending on the weight of the panels, of course. These components are installed above the door along its length, mounted on a tube with a center bracket which holds them in place. A cable drum is attached to each end of the tube, and the cables that wind around those drums are attached to the bottom brackets of the garage door on each side. Rather than lift and lower your door by themselves, torsion springs twist and unwind, and it's their attached cables that actually perform the action. Picture this scenario – an old spring reaches the end of its lifespan and breaks. With the extension type, you have a dangerous situation on your hand. The spring is bound to whip around your garage uncontrollably for a few seconds, and if any person or object is standing in its path, well… that's a bad place to be, let's just put it that way. 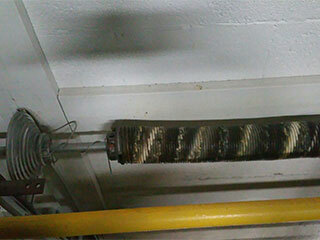 However, when dealing with a torsion spring, the dangers are minimal. Due to the nature of their operation, torsion springs will simply flop and lose tension when they break, and aren't likely to harm anybody. They are also considered to be far stronger, and can support the weight of heavier doors much more safely than extension springs could. If you're dealing with a broken spring, or are looking to get your old ones replaced with new and improved options, call our experts at Garage Door Repair Baytown today.